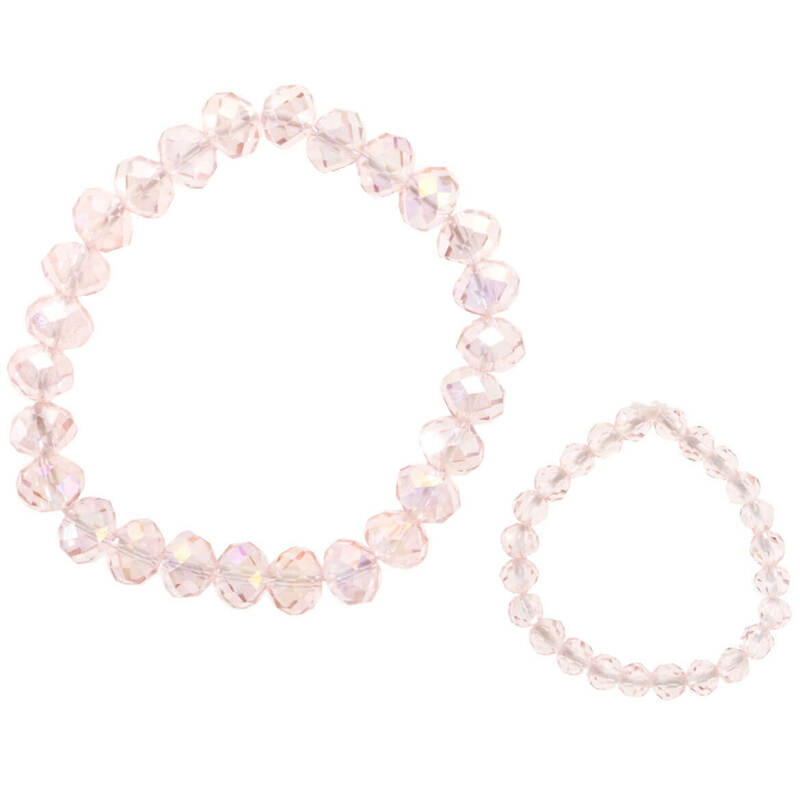 With matching bracelets that shimmer and shine, this Doll ‘N Me pearlescent bracelet set is simply divine! Dazzling with sparkly pearlescent beads, the set includes one pearl bracelet for her and a matching one for her favorite doll—both slipping on for easy, stretch-to-fit comfort. Nestled in a drawstring pouch for giving, the set of 2 includes 2 1/2″ dia. child’s stretch bracelet and matching 1 1/2″ dia. bracelet, designed to fit an 18″ doll. Acrylic, elastic. SMALL PARTS. Not for u003c 3 yrs. Styled like Mom’s, but designed for kids, this personalized children’s purse will be specially made for one well-accessorized child! 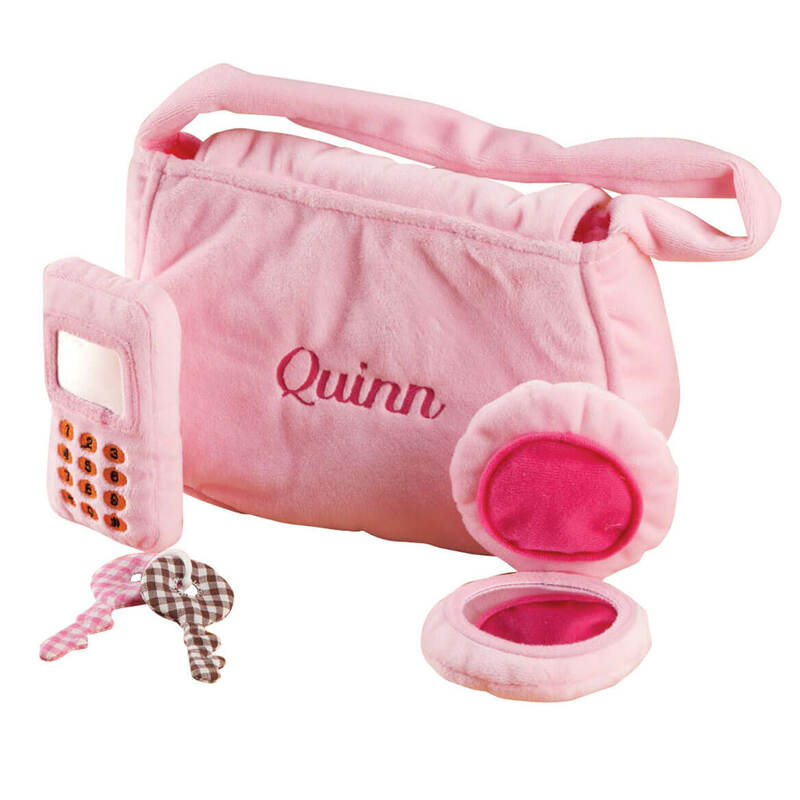 Designed in plush, velvety fabric with hook-and-loop closure, the classic girl’s handbag includes a plush pretend compact, keys and cell phone—inspiring hours of imaginative play. We’ll embroider any name to this adorable purse, creating a custom treasure. Specify name; limit 1 line, 10 letters/spaces. 100% polyester; spot clean. 8″ long x 7″ wide. Imported. Making grooming more comfy for kids, this cute Personalized Children’s Brush will be personalized for added fun—making it hers or his alone. 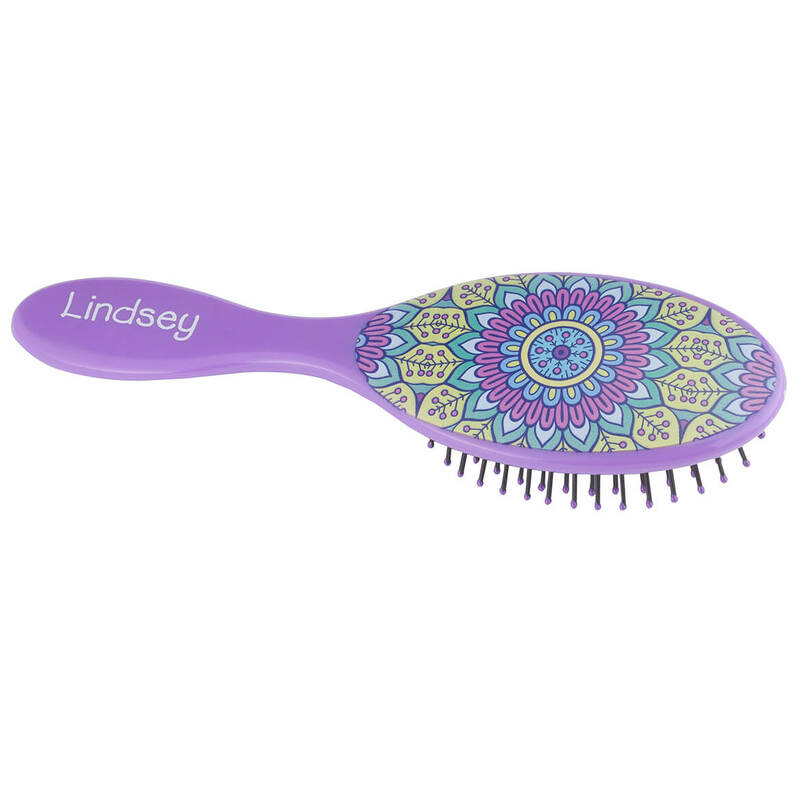 Featuring a bright patterned design with a cushioned base and soft, flexible bristles that won’t snag or pull, it glides easily through wet or dry hair, making detangling less painful for little ones. We’ll add one name to the back of the kid’s brush handle, creating a custom treasure for one darling, well-groomed child! Specify name; limit 1 line, 12 letters/spaces. Hair brush measures 8 1/2″ long x 2 3/4″ wide x 1″ high. Giving young glamour girls the grooming tools they love, this Personalized Children’s Brush and Manicure Set includes a manicure kit with matching purple hair brush—and the brush can be personalized for added fun! Manicure set includes: patterned emery board (4 3/4″ long), plastic cuticle pusher (4″ long), plastic nail brush (2 3/4″ long) and metal nail clippers (2 1/8″ long). 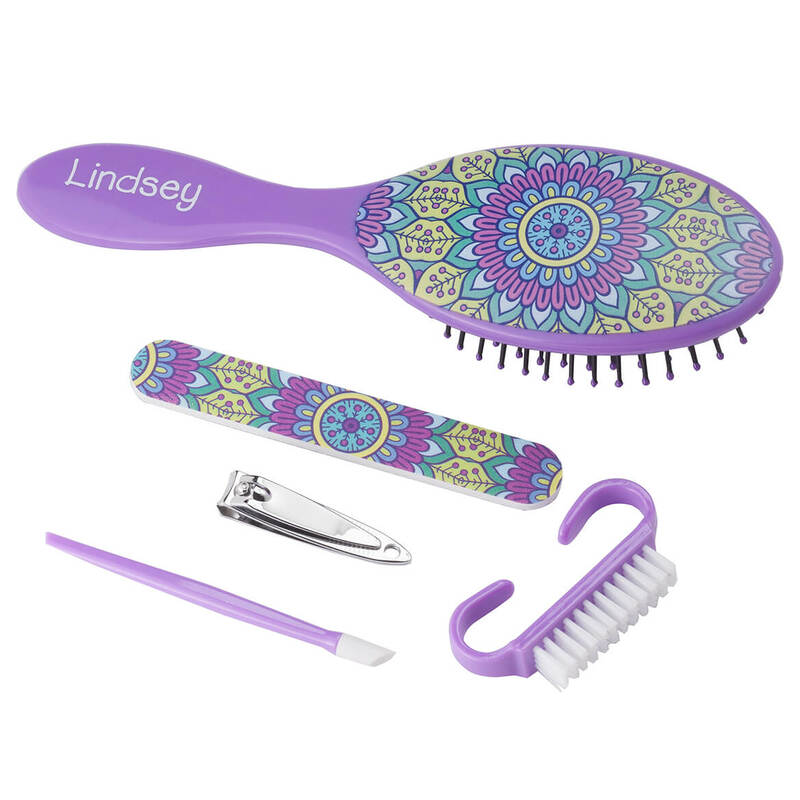 The purple plastic kid’s brush features a matching patterned design with a cushioned base and soft, flexible bristles that glide easily through wet or dry hair without snagging or pulling. We’ll add one name to the back of the hairbrush handle, making it hers alone! Specify name; limit 1 line, 12 letters/spaces. 8 1/2″ long x 2 3/4″ wide x 1″ high. Sparkling and shimmering with five genuine crystals, this crystal butterfly pendant dangles on a dainty golden chain—making any little girl feel special. A sweet keepsake gift for holidays, birthdays or any occasion, our adorable butterfly necklace is nestled in a cute butterfly-shaped velvet box for added fun. Crystal butterfly jewelry is 3/4″ long x 3/4″ wide. Gold-tone metal chain is 16″ long with 2″ extender and lobster clasp. SMALL PARTS. Not for u003c 3 yrs. Dazzling with 11 gorgeous, just-like-Mom’s crystals, this crystal ladybug pendant dangles on a pretty golden chain—the perfect little gift for one lucky little lady! 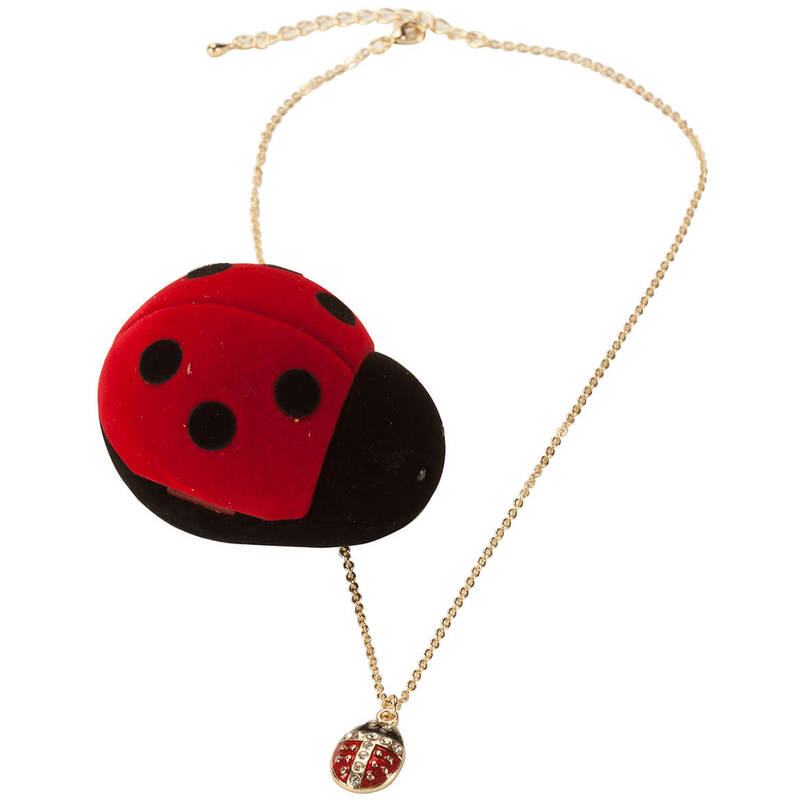 A cute keepsake present for holidays, birthdays or “just because” occasions, our genuine crystal ladybug necklace is nestled in a ladybug-shaped velvet box, so there’s no need to wrap. Ladybug jewelry is 3/4″ long x 1/2″ wide. Gold-tone metal chain is 16″ long with 2″ extender and lobster clasp. SMALL PARTS. Not for u003c 3 yrs.